So every now and then I get a facebook message from a fan asking me about this product or that. And alot of times the product in question ends up being something I’ve never even heard of. Which always astounds me considering just how many products we’ve reviewed here at BPW. But todays product is a perfect example of this. One of my fans sent a Facebook message asking me if I had tried the new Apollo Protein Powder and what I thought about it. ‘Errr. What Apollo Protein Powder?’ Was my sheepish reply. (Yes I actually typed that out). After not too much research I had finally found out what I needed to know about the Apollo Pure Protein Powder. I immediately placed my order and waited patiently by the door for my package to arrive. After just three days my package finally did. I honestly can’t remember the last time I was this excited to do a protein review. I mean, usually I get so much more excited for pre workouts because you can really feel them working so much better that they make for better review material. But hey. Proteins can be fun too. I ripped open my box and was immediately blown away by what I found. I’m doing this review backwards today. Usually for protein powder reviews I start with the taste, then move into the formula, and then conclude with packaging. But Apollo really flipped the whole process upside down. Let me tell you this. 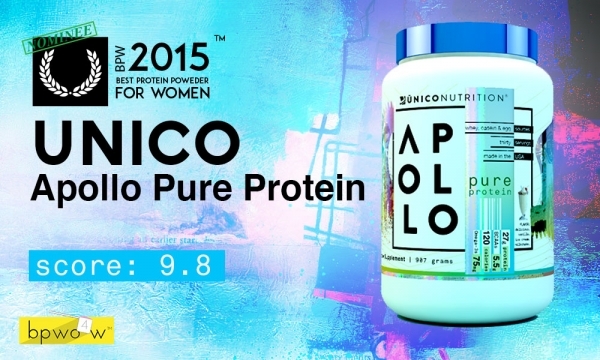 If you go out and buy Apollo, you are buying not just a protein powder but also a work of art. I’m not kidding. When I finish this tub, it’s going on my desk for inspiration. It is SO COOL LOOKING. I don’t know how they came up with the idea to integrate the Apollo sun god theme with the galactic/space theme taken from the Apollo Moon Landing mission- but whoever is responsible for that idea deserves a package design award. Like. It’s really absolutely beautiful. The overall theme is brilliant, and the colors work to set off the label in just the right amount. They use a rainbow palette within certain areas of the label to bring out some of the graphical elements that they wanted to stress. These areas have a really bright, holographic quality, while the rest of the label maintains an understated, ‘matte’ appearance. The product name is big, bold, and stylishly split up into three lines, similar to the rest of the Unico products (that I also love). I could literally spend all day telling you about how much I love this design, but I will save that for a rainy day. But just trust me. You gotta get some of this stuff- if for no other reason than for the packaging alone. It’s simply brilliant. But as we all know- looks can only get you so far. You simply MUST taste good too. (If you’re a protein powder, that is) (LOL). I know. Not the most complicated recipe. But trust me it’s unbelievable how much taste you can get from such a basic recipe. If you’ve ever had a vanilla ‘fribble’ at Friendly’s than you know just how good this shake can be. Like honestly it’s unbelievable that what I just drank has almost 30 grams of protein, very few carbs, and virtually no fat (well, other than the bit of whipped cream and some in the milk). But legit you can make an Apollo shake by itself just the powder and water and come up with something that tastes like 95% as good. I can’t speak highly enough about how freakin good this protein powder tastes. Ok let’s get into the formula and the macros a little more. Believe me. I looked for every chance I could to rip into this product. You know from reading my blog that my reviews usually contain at least ONE segment where I absolutely destroy some aspect of a product- be it the taste, the formula, the packaging (<-most common) etc. etc. But Apollo is one of those rare products where there’s literally nothing wrong with it. It’s an absolutely brilliant product in every sense. And that statement extends to the formula. These three sources are combined in an exact 40:40:20 ratio that has been university researched and proven to be the optimal proportions of fast and slow digesting proteins. I’ve always gotten better results from protein blends, which is another reason why I like Apollo. When you combine the faster and slower sources, your muscles have a more consistent stream of amino acids to use for a longer period of time. Plus, this makes you feel fuller for much longer, which makes it a great ‘cutting’ or dieting protein. 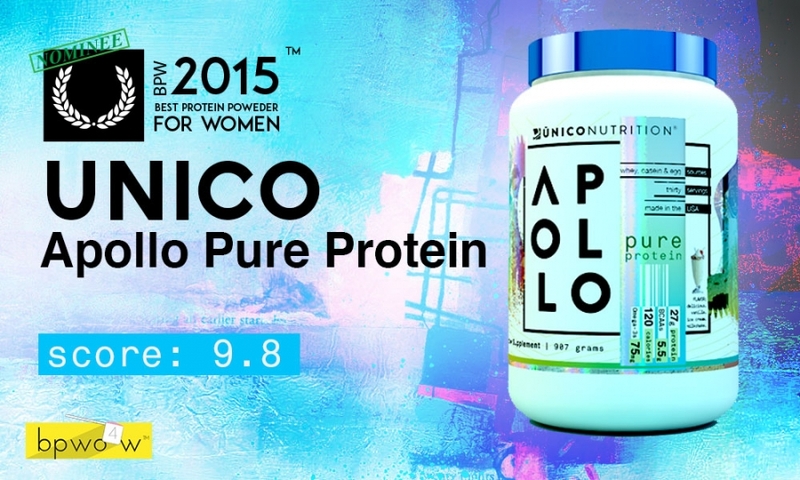 Apollo provides 25 grams of protein, has 120 calories, less than 5 carbohydrates, less than 1 gram of fat. It also has omega 3s, and even 2.5 grams of TruFiber Inulin. The macros are just fantastic in this product. If I had to call Apollo out in one way, I guess it would have to be using the artificial sweeteners in this protein. I don’t think they would be able to make it taste as good as it does if they used stevia (not a huge stevia fan), but I would still be curious to know how good they could make it without the artificial sweeteners. But. Hey. Until some really good evidence comes out damning sucralose, I don’t really have that much of a problem with it. Ok let’s wrap this thing up.